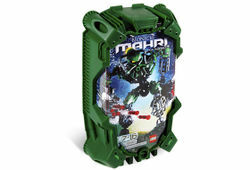 8910 Kongu is a BIONICLE set released in 2007. He is one of the six Toa Mahri. He comes with two Cordak Blasters as well as the Mask of Summoning. It is Kongu's second appearance in a set (third including his appearance as a toy that came with a Happy Meal at McDonalds). In the BIONICLE storyline, he is a Toa of Air. In the original storyline, Kongu gained a new melee weapon of some kind from their transformation into the Toa Mahri, but abandoned it after they found the Cordak Blasters. He is the only Toa Mahri to have two Cordak blasters. This is a description taken from LEGO.com. Please do not modify it. (see an archive of the product's page) Ready for undersea action!